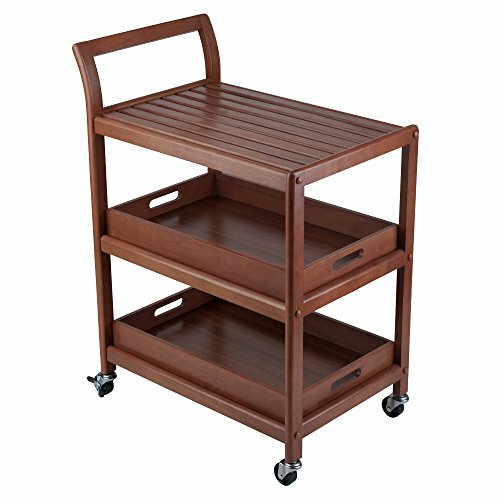 Roll the Albert Entertainment cart into your dining area, family room, or patio to get the party started. The cart comes with 2 removable serving trays with cut-out handles and a slatted wood shelf on the Bottom tier. It also features a convenient curved handle for easy maneuvering. Perfect for bringing bottles, glassware, hors d'oevres, or meals to your guests. Made of solid and composite wood in a walnut finish. Rolls smoothly on casters, two of which are locking. Overall size is 24.8"W x 15.9"D x 33.2"H.